ON.COM.pk (the “website”) welcomes you all. Insha Allah will soon become the largest online shopping portal of Pakistan. These terms and conditions (“Terms and Conditions”) are applicable not only to the website, but all of its subsidiaries, divisions, and affiliate operated websites which reference these Terms and Conditions. Your access to this online website Site is subject to your understanding and acceptance of following Terms and Conditions. However, you are requested to discontinue the use of this website if you do not accept the Terms and Conditions. The Site reserves the right to add, remove, change, or modify any clause of the Terms and Conditions anytime without providing any prior notice. The changes, modification, removal, and the addition of any information on the Site will be considered effective from the time it is posted. Users are advised to regularly check the Terms and Conditions of the website to stay updated. If you continue to use this website even after changes, then it will constitute as your acceptance of revised/changed Terms and Conditions. By using this website, you confirm that you are either at least 18 years old or accessing the website under the supervision of an adult (your parent or legal guardian). The Site offers you a non-revocable license to use it, subject to your acceptance and understanding of the Terms and Conditions for shopping items offered/available on the Site for sale. We prohibit you to use this Site for commercial purposes or on behalf of any third party unless express permission is obtained in advanced by the Site. Violation of any Terms and Conditions will result in immediate revocation of your license provided to you, for which no prior notice will be provided. Everything that you provide us or submit on the Site will become our exclusive property, including but not limited to reviews, comments, suggestions, and questions (collectively called “Submissions”). All Submissions are non-returnable, and your claim to them will not be entertained. The Site reserves the right to change, edit, delete or modify any Submissions, but is not obligated to do so. You are obligated to provide us the correct name, address, email address and other details. Moreover, with your Submission, you grant us the right to use your name/username that you have provided. You agree that you will not, under any circumstances, attempt to mislead us using fake details or by pretending to be someone else. As a measure to prevent credit and debit card fraud, the Site reserves the right to verify your personal information that you have provided or obtain validation of your payment details before shipping the product. The Site may ask you to verify your account through identity card, banking details or your place of residence. In case, you failed to provide the required verification document/information within two (2) days after receiving respective notification, your order will be canceled automatically. The Site can also cancel any order directly if we suspect there is a risk of credit or debit card fraud. On this Site, all intellectual property (registered or unregistered) shall remain our property, which is protected under Pakistan’s copyright laws and international conventions. The intellectual property of the Site includes but without limitations graphics, software, source code(s), designs, layouts, logos, videos, photos, information content, music, audios, and all software compilations. All rights are reserved. This Site provides you with all products, content, information, materials, items and other services on “as is” and “as available” basis, unless otherwise specified in writing. We do not make any warranty or representation, implied or express, about products, content, information, materials, items and other services, unless otherwise specified in writing. If you continue to use this Site, you expressly agree that you are using this Site at your own risk. Electronic communications referred to any mode of communication that uses electronic means including feature phones, smartphones, computers, tablets, and any other electronic device. When you send us an email, a text, or submit a request form, you are communicating with the Site electronically. By communicating with us, you also grant us the right to communicate with you electronically. You also give your consent that all agreements, notices, disclosures, and other communications provided to you by the Site satisfy all legal requirements that such communications be in writing. The laws of Pakistan shall govern the Terms and Conditions of using this Site, and shall be interpreted accordingly. Should you choose to continue this Site, you accept the jurisdiction of Pakistan’s court and laws while waving any objection on the basis of the venue. The Site reserves the right to terminate Terms and Conditions immediately in addition to any other legal or equitable remedies. The Site can also revoke your license as well as the rights granted in Terms and Conditions. In either case, you agree to discontinue the use of this Site, and acknowledge the rights of the Site to revoke all account details (including but not limited to username, password, address, and financial details among others) and deny you complete or partial access. However, the termination of Terms and Conditions shall not affect the respective rights and obligations of the parties i.e. payment obligations and others, arising before the date of termination. Moreover, you agree that the Site cannot be held liable to you or to any other party (person) for revocation of license, restricted access, and termination. In case, you disagree with our Terms and Conditions, procedures, operation practices, rules, and regulations, then you should discontinue using this Site immediately. It is the customer's responsibility to login earlier if they want to avail better products or styles because ON.COM.pk sales are "first come, first served". The merchandise is not restocked once sold out. No information regarding the presence of any Product in our stock will be guaranteed and we will alert you only when an item is sold out. You will create a password and account designation upon completing the Website's registration process. You are responsible for maintaining the confidentiality of the password and account and are fully responsible for all activities that occur under your password or account. You agree to (a) immediately notify ON.COM.pk of any unauthorized use of your password or account or any other breach of security, and (b) ensure that you exit from your account at the end of each session. ON.com.pk cannot and will not be liable for any loss or damage arising from your failure to comply with complies with our TOS. ON.com.pk provides a number of Internet-based services through the Web Site (all such services, collectively, the "Service"). One such service enables users to purchase original merchandise such as clothing, Artificial Jewelry, Handbags, Wallets, Plants, etc. (Collectively, "Products"). Upon placing an order, On.com.pk shall ship the product to you and be entitled to its payment for the Services. The User agrees and undertakes not to reverse engineer, modify, copy, distribute, transmit, display, perform, reproduce, publish, license, create derivative works from, transfer, or sell any information or software obtained from the Website. Limited reproduction and copying of the content of the Website are permitted provided that on.com.pk name is clearly stated as the source and prior written permission of on.com.pk sought. For the removal of doubt, it is clarified that unlimited or wholesale reproduction, copying of the content for commercial or non-commercial purposes and unwarranted modification of data and information within the content of the Website is not permitted. The user guarantees, warrants, and certifies that you are the owner of the content which you submit or otherwise authorized to use the content and that the content does not infringe upon the property rights, intellectual property rights or other rights of others. You further warrant that to your knowledge, no action, suit, proceeding, or investigation has been instituted or threatened relating to any content, including trademark, trade name service mark, and copyright formerly or currently used by you in connection with the Services rendered by on.com.pk. On.com.pk hereby disclaims any guarantees of exactness as to the finish and appearance of the final Product as ordered by the user. The quality of any products, Services, information, or other material purchased or obtained by you through the Website may not meet your expectations or may vary in colors as compared to the image shown on product display in online catalog. 1. Unless otherwise indicated or anything contained to the contrary or any proprietary material owned by a third party and so expressly mentioned, respective brand owners in most cases and on.com.pk in some cases, owns certain Intellectual Property Rights to and into the Website, including, without limitation, any and all rights, title and interest in and to copyright, related rights, patents, utility models, trademarks, trade names, service marks, designs, know-how, trade secrets and inventions (whether patentable or not), goodwill, source code, meta tags, databases, text, content, graphics, icons, and hyperlinks. You acknowledge and agree that you shall not use, reproduce or distribute any content from the Website belonging to on.com.pk without obtaining authorization from on.com.pk. 2. Notwithstanding the foregoing, it is expressly clarified that you will retain ownership and shall solely be responsible for any content that you provide or upload when using any Service, including any text, data, information, images, photographs, music, sound, video or any other material which you may upload, transmit or store when making use of our various Service. However, with regard to the product customization Service (as against other Services like blogs and forums) you expressly agree that by uploading and posting content on to the Website for public viewing and reproduction/use of your content by third-party users, you accept the User whereby you grant a non-exclusive license for the use of the same. The Website may contain links to other websites ("Linked Sites"). The Linked Sites are not under the control of eZone.PK or the Website and eZone.PK is not responsible for the contents of any Linked Site, including without limitation any link contained in a Linked Site, or any changes or updates to a Linked Site. On.com.pk is not responsible for any form of transmission, whatsoever, received by you from any Linked Site. On.com.pk is providing these links to you only as a convenience, and the inclusion of any link does not imply endorsement by eZone.PK or the Website of the Linked Sites or any association with its operators or owners including the legal heirs or assigns thereof. The users are requested to verify the accuracy of all information on their own before undertaking any reliance on such information. On.com.pk has endeavored to ensure that all the information on the Website is correct, but on.com.pk neither warrants nor makes any representations regarding the quality, accuracy or completeness of any data, information, product or Service. In no event shall on.com.pk be liable for any direct, indirect, punitive, incidental, special, consequential damages or any other damages resulting from: (a) the use or the inability to use the Services; (b) unauthorized access to or alteration of the user's transmissions or data; (c) any other matter relating to the services; including, without limitation, damages for loss of use, data or profits, arising out of or in any way connected with the use or performance of the Website or Service. Neither shall on.com.pk be responsible for the delay or inability to use the Website or related services, the provision of or failure to provide Services, or for any information, software, products, services and related graphics obtained through the Website, or otherwise arising out of the use of the website, whether based on contract, tort, negligence, strict liability or otherwise. Further, on.com.pk shall not be held responsible for non-availability of the Website during periodic maintenance operations or any unplanned suspension of access to the website that may occur due to technical reasons or for any reason beyond on.com.pk control. The user understands and agrees that any material and/or data downloaded or otherwise obtained through the Website is done entirely at their own discretion and risk and they will be solely responsible for any damage to their computer systems or loss of data that results from the download of such material and/or data. You agree to indemnify, defend and hold harmless our group websites from and against any and all losses, liabilities, claims, damages, costs and expenses (including legal fees and disbursements in connection therewith and interest chargeable thereon) asserted against or incurred by on.com.pk that arise out of, result from, or may be payable by virtue of, any breach or non-performance of any representation, warranty, covenant or agreement made or obligation to be performed by you pursuant to these Terms. Prices for products are described on our Website and are incorporated into these Terms by reference. All prices are in PAK Rupees. 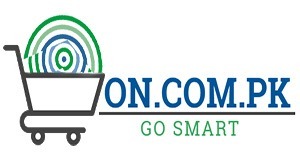 Prices, products, and Services may change at on.com.pk discretion without prior notice. Title and risk of loss for all products ordered by you shall pass on to you upon on.com.pk shipment to the shipping carrier/courier service. 1. On.com.pk may suspend or terminate your use of the Website or any Service if it believes, in its sole and absolute discretion that you have breached any of the Terms. 2. If you or on.com.pk terminates your use of the Website or any Service, on.com.pk may delete any content or other materials relating to your use of the Service and on.com.pk will have no liability to you or any third party for doing so. These terms shall be governed by and constructed in accordance with the laws of Pakistan without reference to conflict of laws principles and disputes arising in relation hereto shall be subject to the exclusive jurisdiction of the courts at Sialkot.